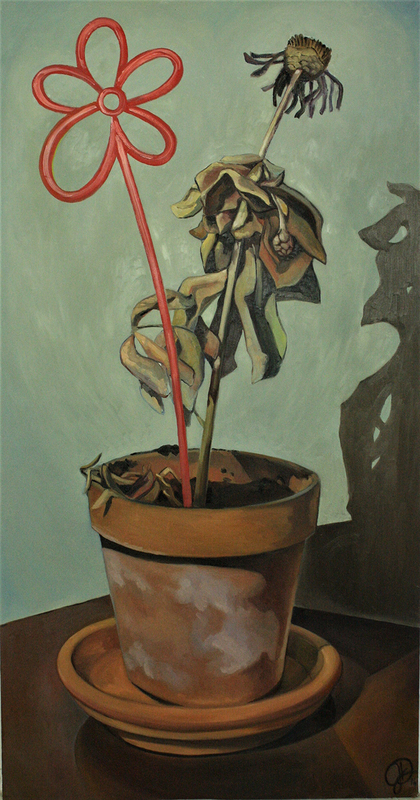 In Julia Davis’ painting, “Remember Her,” a dead and decaying flower still stands in potted soil, but planted next to it is an artificial, linear symbol of a flower. Not the plastic artificial flowers found in municipal spaces that deceive our ideal of beauty, but a graphic element designed to represent an organic, living thing as a mockery of its spent life force. Like a garish neon sign installed as a tombstone, it cruelly echoes the memory of the thing that has passed. The same effect is present in “She’s Been Gone Awhile Now,” only now the subject is a pair of leather boots. While not organic, the title seems to reinforce a sense of loss, the boots perhaps a favorite pair of the departed. There is a child-like perspective on loss at work here. Small children, especially, would take notice of footwear from their low vantage point, playing in the grass as the boots pass by. So the images connect powerfully to memory, and particularly the randomness of that phenomenon. We recall such details from as long as a lifetime ago: single items, smells, the ephemeral quality of nostalgia, and a heightened sense of place. 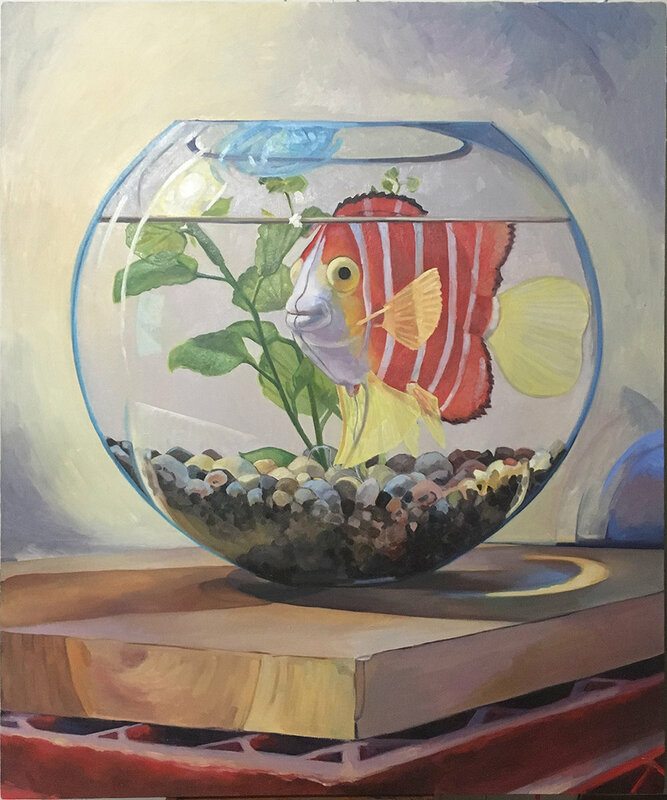 Yet Davis’ humor is also on ample display in “Alternative Facts”, in which she plays with scale and proportion in her depiction of an orange clown fish that seems to be posing, perhaps even preening, for the viewer. 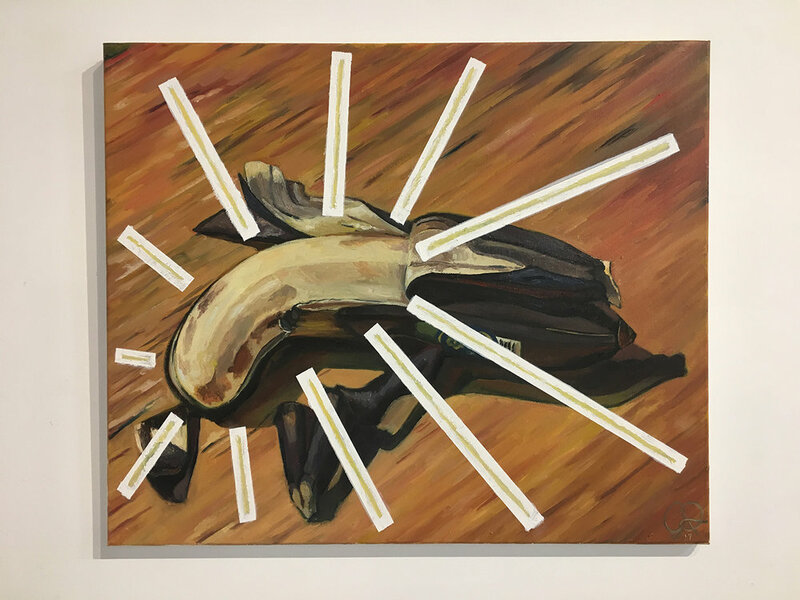 While even the paintings involving death and loss are never lugubrious, her fishbowl scene is the height of accessibility in contemporary art. Davis is currently a teacher in Louisville Visual Art (LVA) Children Fine Art Classes and Community outreach programs. She won 2nd place in the 2017 Portland Art and Heritage Fair Juried Exhibition, and is included in Artists in our Midst at Kaviar Forge Gallery through December 30, 2017. Julia Davis will be participating in the 2017 Open Studio Weekend, sponsored by Louisville Visual Art and University of Louisville’s Hite Art Institute. Her studio in the Portland neighborhood will be open the weekend of November 4 and 5. Tickets for Open Studio Weekend will go on sale October 16. Click here for more information.